Theodore Mitchell was born in Cambridge, Massachusetts on October 26, 1890, the youngest child in a family of six. Most of his boyhood was spent in Needham, a suburb of Boston. Dr. Mitchell attended Massachusetts Agricultural College where he majored in Entomology. During the summer months he was employed as the deputy State Nursery Inspector and also became involved in survey projects on the Gypsy Moth, the European Corn Boroer, and White Pine Blister Rust. In 1917, Dr. Mitchell's college career was interrupted by his induction into the army during World War I. His unit reached France in 1918, but armistice brought an end to hostilities before he reached the front lines. Returning to the United States in 1919, he graduated from college in 1920. Shortly after graduation, Dr. Mitchell accepted a position in North Carolina as Nursery Inspector for the North Carolina Department of Agriculture. Each summer he had to cover the entire state in his survey trips. As part of his job he collected insects for the state insect collection and during the slow winter months, he used to spend long hours going over this marterial making identifications. Lack of field duties in the winter also enabled him to take courses at North Carolina State College and in 1924, he receive his M.S. At N.C. State he became associated with Dr. Z. P. Metcalf, a friendship which continued for some thirty years until Dr. Metcalf's death in 1956. Some of Dr. Mitchell's other colleagues at this time were: C. S. Brimley, who compiled the Insects of North Carolina, and who accompanied Dr. Mitchell on many collecting trips; Franklin Sherman, head of the Division of Entomology in the State Department of Agriculture; and J. B. Crawford, formerly of the U.S. National Museum, who had done much work with the native bee fauna. In 1926, Dr. Mitchell joined the faculty of the Department of Zoology and Entomology at North Carolina State College. Dr. Mitchell's first published studies on megachilid bees were printed at this time. In 1926 he was accepted for graduate study at the Bussey Institute of Harvard University and within two years earned his Ph.D.
During and just previous to his residence at Harvard, Dr. Mitchell had been developing a revision of the Megachile of the Nearctic region. This was eventually completed and published in eight parts from 1934-1937. With the help of the National Science Foundation, Dr. Mitchell saw the opportunity to publish a comprehensive work on the bee fauna of eastern United States and from 1955 to 1962 all his research activities were devoted to this end. Part I of The Bees of the Eastern United States appeared in 1960 and part II in 1962. 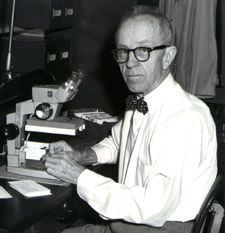 He retired from the NCSU Department of Entomology in June, 1961. Dr. Mitchell continued with his studies even in his retirement and continued to work and publish revisional studies on the Megachile and Coelioxys. The NC State Library retains a collection of Mitchell's papers.